India-based production and distribution outfit Aadarsh is teaming with France’s Cyber Group Studios to coproduce and sell forthcoming animation series Purple Turtle. The preschool show is based on the educational book of the same name. Aadarsh will help bring it to TV and digital platforms as well as handling licensing, merchandising and publishing rights globally, except Asia and MENA but including China. Purple Turtle first appeared at the Frankfurt Book Fair in 2012, with millions of copies since being produced in multiple languages worldwide. Aadarsh previously pitched an animated version at MipTV in 2014. The latest 52×7’ animated version is being directed by Swati Rajoria, produced by Ankita Shrivastava and written by Emmy winners including Karl Geurs (Disney’s Jungle Book II, Winnie the Pooh, Strawberry Shortcake) and Dev Ross (Rainbow Ruby, Little People, Clifford the Big Red Dog). 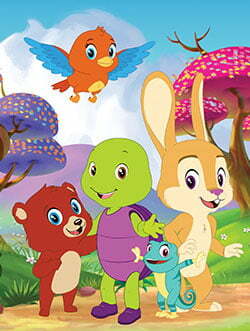 The series follows the adventures of the eponymous hero and his friends: Roxy the Chameleon, Zing the Rabbit, Melody the Bird and Tadley the Bear. Through each episode, Purple Turtle and his friends encourage kids to explore, make choices, learn from their mistakes and make decisions along the way.